The 'Formatic' range of four machines guarantee accurate forming and portioning of a wide variety of food mixtures and products. Designed to make biscuits or cookies, the machine is based on interchangeable drums which give the shape of the product and with the use of synchronised paddles, it gently presses the mixture into the required form shape. The drum then rotates and deposits the shape onto an off-feed conveyor. 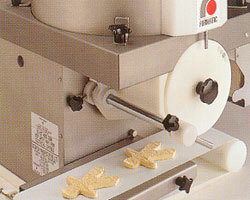 Biscuits can be produced up to 150mm diameter and from 6 - 24mm in thickness. For smaller products, drums can be either two or three across, giving either double or treble the output. Drums are available in any shape to suit a customers requirements i.e. gingerbread men, cartoon characters, stars, oval etc. 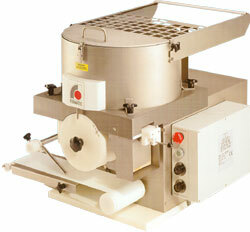 Ideal also for providing billets of pastry for use in pie machines, giving an accurate weight in a pre set diameter. 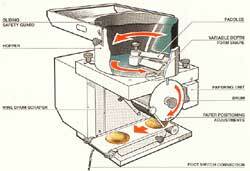 Machines can be synchronised to feed directly onto rotary pie machines. The 'Traymatic' is an automated version of the Formatic, depositing the portion in a pre-set position directly onto a baking sheet. When used in the meat industry, it can be fitted with automatic paper dispensing for papering inbetween burgers.